Agron at the Glee premiere party, May 2009. 2006 Close To Home Drunk Girl 集稱: "Homecoming"
2006 CSI: NY Jessica Grant 集稱: "Murder Sings the Blues"
2006 Drake & Josh Lexi 集稱: "The Great Doheny"
2006 Shark Gia Mellon 集稱: "Love Triangle"
2008 Numb3rs Kelly Rand 集稱: "Jack of All Trades"
2012 Punk'd 本人 集稱: "Hayden Panettiere"
2012 Glee Project, TheThe·Glee Project 本人 客串來賓，集稱: "Actability"
^ Agron, Dianna. June 2, 2000 – What does that day, month and year mean to you?. Tumblr. June 12, 2011 [January 8, 2012]. （原始内容存档于2012年7月13日）. ^ Miller, Julie. "Dianna Agron Worked on Her High School Yearbook, and 4 Other Gleeful Revelations" 页面存档备份，存于互联网档案馆, Movieline, January 27, 2011. ^ 5.0 5.1 Zuckerman, Suzanne. Dreaming Big: Dianna Agron of Glee. Womens Health. January 28, 2010. ^ Extra Extra! More With Glee's Dianna Agron and Mark Salling. Paper Magazine. April 5, 2010 [May 20, 2018]. ^ 8.0 8.1 Miller, Gerri. Glee Club Glory|. JVibe. August 2009 [August 2, 2009]. ^ 'Glee' Season Premiere Hits a High Note at Comic-Con. ScreenRant. July 27, 2009 [July 28, 2009]. ^ Nordstrom, Leigh. Dianna Agron Is Ready for Her Next Act. 女裝日報. November 2, 2017 [May 20, 2018]. ^ Dianna Agron Cosmopolitan Interview Fanpop. Retrieved September 2011. ^ Jeanne Sager. 'Glee' Star Dianna Agron Has a Weird Definition of Popular | The Stir. Thestir.cafemom.com. February 6, 2011 [August 10, 2012]. ^ Ghosh, Korbi. 'Glee': Mark Salling, Lea Michele & Dianna Agron on pregnancy, lies & love. Zap2it.com. September 30, 2009 [February 18, 2011]. （原始内容存档于2011年3月2日）. ^ Dianna Agron- Biography. Yahoo! Movies. [October 22, 2012]. ^ 826LA's Chickens in Love. [August 2, 2009]. ^ Op Unveils It's 'Rock Your Shine' Marketing Campaign. ^ 23.0 23.1 23.2 Glee Casting: Quinn. Hulu.com. [March 22, 2011]. （原始内容存档于2011-03-13）. ^ Waterman, Lauren. Dianna Agron. Interview Magazine.com. [February 18, 2011]. ^ Glee – Dianna Agron. FoxSource. YouTube. May 18, 2009 [June 2, 2009]. ^ HitFix interviews the cast of 'Glee'. Hitfix.com. May 19, 2009 [March 18, 2011]. （原始内容存档于2012年5月27日）. ^ Teen Choice Awards 2010 Winners : Full List. Celebglitz. August 8, 2010 [August 9, 2010]. ^ 16th Annual Screen Actors Guild Awards scorecard. Los Angeles Times (Tribune Company). January 23, 2010 [January 24, 2010]. ^ Nominations Announced for the 17th Annual Screen Actors Guild Awards. www.sag.org. Screen Actors Guild. December 16, 2010 [December 16, 2010]. ^ Goldman, Eric. Glee: "Ballad" Review. IGN. November 19, 2009 [November 19, 2009]. ^ Kennedy, Gerrick D. 'Glee': A hairlicious distraction before Thanksgiving. Los Angeles Times. Tribune Company. November 26, 2009 [November 26, 2009]. ^ Hankinson, Bobby. Glee: Hair today, gone for 4 months tomorrow. Houston Chronicle. Hearst Corporation. November 26, 2009 [November 26, 2009]. （原始内容存档于2012年8月28日）. ^ VanDerWerff, Todd. The Purple Piano Project. The A.V. Club. The Onion. September 21, 2011 [September 21, 2011]. ^ 35.0 35.1 35.2 Linder, Brian. Glee: The Music – Vol. 1 Review. IGN. November 4, 2009 [December 5, 2009]. ^ 36.0 36.1 Linder, Brian. Glee: The Music, Vol. 2 Review. IGN. December 8, 2009 [December 9, 2009]. （原始内容存档于2011年7月13日）. ^ Flandez, Raymund. "Glee" Season 1, Episode 7: TV Recap. The Wall Street Journal. October 15, 2009 [October 27, 2009]. ^ Chaney, Jen. Glee' by the musical numbers: Maxing out on Michael Jackson. The Washington Post. Katharine Weymouth. January 31, 2012 [February 6, 2012]. ^ Lynch, Joseph Brannigan. Glee' recap: An 'Off the Wall' Tribute to MJ. Entertainment Weekly (Time Inc.). February 1, 2012 [February 6, 2012]. ^ Bell, Crystal. Glee' Recap: Tribute To Michael Jackson. HuffPost TV. Huffington Post. January 31, 2012 [February 6, 2012]. ^ Stanhope, Kate. Glee's Promising Road to Graduation Begins. TV Guide. January 31, 2012 [February 6, 2012]. ^ Futterman, Erica. Glee' Recap: A Tribute Worthy of a King. Rolling Stone. Wenner Media LLC. February 1, 2012 [February 6, 2012]. ^ Slezak, Michael. Glee Recap: A Thriller of a Night!. TVLine. Mail.com Media. January 31, 2012 [February 6, 2012]. ^ Dianna Agron Playing De Niro's Daughter in Luc Besson's 'Malavita' (Exclusive) The Hollywood Reporter. Retrieved July 14, 2012. ^ Dianna Agron in Nintendo "Play As You Are" Campaign. [September 19, 2012]. ^ "Dianna Agron Birthday Project : The Trevor Project" 互联网档案馆的存檔，存档日期2012-07-21. Causes.com. Retrieved May 1, 2012. ^ "826 Love" Tumblr. Retrieved August 5, 2012. ^ "Hey guys, can you help?" Tumblr. Retrieved August 5, 2012. 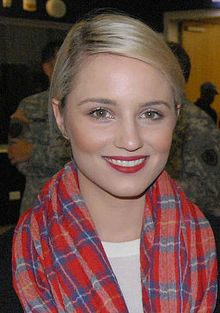 ^ Dianna Agron Speaks Up for Gay Rights. Teen Hollywood. [June 13, 2011]. ^ Dianna Agron Tells David Letterman She Had Her Nose Fixed. Huffington Post. [August 2, 2011]. ^ "Vanity Fair!!!" Tumblr. Retrieved February 9, 2012. ^ Ashley Baylen. Top 50 Hottest Jewish Women (10–1) – Page2. Shalom Life. April 12, 2012 [May 2, 2013]. （原始内容存档于2013年7月27日）.